See an internal view of the Stiebel Eltron Tempra 29 Plus tankless water heater - learn how it works and what makes it superior to the competition. The Stiebel Eltron Tempra 29 Plus electric tankless water heater is a powerful 28.8KW heater designed for whole house and commercial applications in cold climates where the incoming water temperature can drop below 40° F. It is also a popular choice for homes in warmer climates with high flow demands where multiple simultaneous hot water demands are required (up to 6 gallons per minute), or where fast fill rates for large Roman or bath tubs is desired. 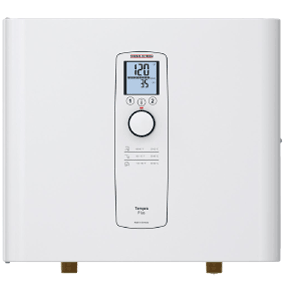 Like all Tempra Plus Series tankless water heaters, the Tempra 29 Plus features true microprocessor-controlled temperature regulation as well as a convenient digital temperature display and dial selector which allows you to set the desired output water temperature at any level between 86 and 140F (30 and 60C). It is one of the only tankless water heaters on the market that features a true thermostatic temperature control and full power-modulation based on both the incoming water temperature and the water flow rate. The Tempra 29 Plus will automatically adjust its power output to accommodate changes in the incoming water temperature and flow rate so it can precisely maintain the desired output temperature. The Tempra 29 Plus also features Stiebel Eltron's exclusive dynamic Advanced Flow Control technology. This technology automatically adjusts the flow of water when the unit's sensors detect that the flow demand is exceeding the heater's capacity. This feature is particularly useful in cold climates and other applications where the electrical service size does not permit the installation of a larger model and it may be desirable to handle occasional high flow demands. It is also desirable where high output temperatures are required for temperature critical applications (commercial dishwashers, etc.) and where flow rates are not always predictable. Purchase and installed my unit in April 2015; wanted to wait a full year before making a review. In a small utility/laundry room I replaced my 40gal electric hot water storage tank with a 60gal storage tank for storing solar thermally heated water. I did not have room for 2 tanks so I decided to go tank less water heating. I reviewed options when professional advise given to me was to go natural gas, but decided after careful study to go with the Tempra 29 PLUS. The savings I am making by preheating my domestic water with Solar Thermal collector panels is showing up as 8kwH/day and the Tempra 29PLUS kicks in when there has been no sun for several days. I have the Tempra set high at 128 and my my solar thermal storage tank set at max temp of 175degF; there are no issues with water at 175degC passing through Tempra...it just does not power on. When there is no sun for several days the Tempra can handle both showers in the home being used at the same time with no issues, and my hydro bill does not kick upwards. A little more expensive to install than a condensing natural gas tankless, but if you have space challenges and cannot get flues out through a wall then this E-tankless is a great way to go, especially with Solar Thermal Hot water preheating. We installed our Tempra 29 Plus in 2010 and the unit has worked flawlessly since we've owned it. The odd time, we'll adjust the temperature up or down a few degrees, but it has been hanging on the storage room wall untouched for the most part. The heating is very even in the shower and for washing dishes. No temperature fluctuations at all. Other than some fixtures that are a long way away from the heater, the water is heated and arrives as the faucets very quickly. For dishwasher loads (and if there's a hot load of laundry) we always run the closest sink until we get hot water and then turn on the wash cycle. In terms of operating costs, the household hydro bill is slightly higher, but very reasonable. Our gas bill has probably decreased more than enough to offset the increase in hydro. This unit has been very efficient for our family and still operates as well now as it did the day we put it into use. Would definitely recommend this efficient heater to other people here in B.C. or other parts of the country. Excellent water heater. The plumber said it was easy to install. Super tech support, documentation was first rate. But the most important there is plenty of hot water, and no huge tank in the garage any longer. I am very happy with our conversion to tankless. This product is outstanding; well-built and works as advertised. However, I wish the flow detection switch was either more sensitive, or user adjustable. As is, you have to turn the hot water on to a pretty high rate of flow for the heater to kick on. This is fine for most uses, but for things like shaving, where I would normally turn the water on at a slow rate, the flow is not detected by the heater. I turn the water up to solve this, but can't help thinking about the amount of water that is being wasted. One of the reasons I converted is wasted energy on a tank, and now it seems the waste was just shifted to water use. I installed the water heater in February in Saint Paul, MN. My water temperature coming from the street is probably in the forties Fahrenheit. It is cold enough to make your hands numb. I was a little worried that it wouldn't have enough capacity for my family of 6 with 4 bathrooms. It is working just fine. After some experimenting, we ended up setting the temperature at 115. We can easily take 2 showers at the same time. If the washer and dishwasher are going at the same time, the 3rd floor shower will decrease flow to a trickle without changing temperature. I am very happy so far. I installed it myself. I have a 200 amp service so I had room for the necessary 3 separate 30 amp 220 volt circuits. Some electrical items in the house will exhibit a little fluctuation when the heater kicks in, although it is pretty subtle. Hopefully it continues this performance over the long haul. If it lasts 15 years with this performance, I will be very happy. The heater is extremely easy to install. It is is even easier to operate. It worked perfectly the moment it was commissioned and performs the same on every use. The water is hot more quickly and it is great to have an endless supply of hot water. 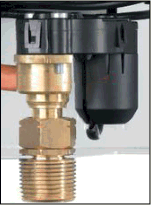 E-Tankless was a great resource, responsive, and shipped the heater quickly. They are a fantastic company with great quality products and service. We have had our tankless heater for over 6 weeks and it has not failed to produce all the hot water (128 degrees). Several showers at once and a washing machine. Very impressed. Have noticed a slight increase in electric bill but, it's worth it to not have to worry about running out of water! Love my new water heater, light years ahead of my old Sets system. User instructions could be a bit better as could install instructions. Should mention a flushing system should be installed at the same time to get rid of calcium..
Im in CA and I replaced it in the summer, so far it was easy to install, and easy to work with, I will know if it is the perfect unit when winter comes and the inbound water is colder but so far so good. 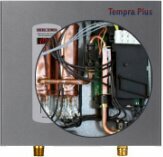 I purchased a Tempra Plus water heater and had it installed by Professional plumber/electrician and it works perfect so far.